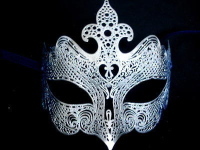 Dramatic Ladies Venetian Masquerade ball mask made with black filigree metal & Swarovski crystals. 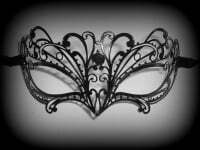 Dramatic butterfly shaped ladies Venetian Masquerade mask. This elegant mask is made from black laser cut filigree metal and adorned with authentic Swarovski crystals. 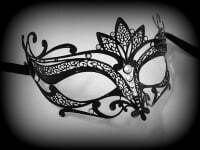 With traditional satin ties, the mask is perfect for your next Masquerade wedding, party or Venetian masked ball.